First time with Sailing Delight? No need to fear, Sailing Delight is like 'yachting', not pulling ropes and listening to screaming captain. + Imagine you can take your hotel with you at all times. At the beach, close by the city center, next to the bar or just accompanying us during our night voyages – because that is exactly what a yacht can do. + Want to sightsee? No problem! The attractions are everywhere - and new ones with every day! + Looking for the best pool on earth? On our cruises you can just take dive off the deck into the crystal-clear water any time you feel like it. + And where would we be sleeping? Well, our bedrooms are always just a few steps away and when you get up, you magically arrived at yet another breathtaking location. + Need to cool off? Beat the heat in the shade of sails, the sea breeze, and AC inside the yacht. Oh, and remember, there is an effective water-cooling system readily available at any time and just a leap off the boat away. + Restaurant? Drink a beer... It's almost here, I mean - we're almost there. The one with the view for the sea, sunset, sunrise, beautiful beach, blue sky, colorful bay, and gorgeous island we drive along with us. + In need of a cold drink? We have a fully-equipped refrigerator on board at all times containing things like fresh orange juice from oranges we picked on the last island, cold beer from the local brewery and shrimps from the fisherman we met the day before. + Like to experience the under-water world? No problem whatsoever! There are calm, beautiful bays everywhere we go and diving masks and snorkels are available at all times. + Hey, but I cannot sail – No worries and welcome to the era of modern, easy sailing! Our skippers are all well trained – and the rest of the crew can learn as much as they feel like. 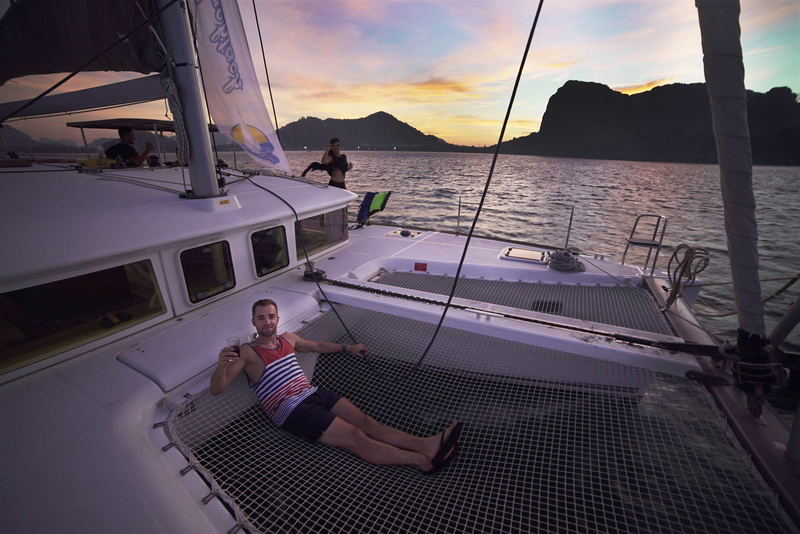 If you would rather sunbathe on the bow, drink a beer, or enjoy the beautiful views - we need those positions filled as well! + Have you ever seen dolphins jumping and swimming next to your boat? Well, we have, and so can you! + And if something breaks? Isn’t this stuff really expensive? Don’t worry, we have good insurance. Everything is covered. + Got the urge for some serious action? No matter if you would like to ride a jetski, get a motorboat for wakeboarding, try out flyboarding or even parachuting – this is all possible! Or just call us +48 515 145 144 and ask.